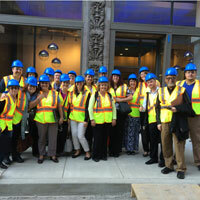 The GLA fellows donned hard hats to tour the Arcade Building, currently being preserved and renovated as part of the Gateway Campus in downtown St. Louis. In St. Louis for their final weeklong gathering of this yearlong transformative experience, the 2015 cohort of the Global Leadership Academy spent Thursday gaining insights about the metropolitan campuses in Webster's network. Starting in the Old Post Office building of the Gateway Campus in downtown St. Louis, the fellows heard an overview of the St. Louis Metro Extended campuses by Thao Dang-Williams, Pat Froeckman, Debra Ingles and Mike Taylor. Sean Coleman, associate vice president of Military Affairs and director of the National Capitol Region, rounded out the morning with a workshop, "Extended Campus Leadership: Strategies and Skills." Coleman has been conducting research on traits of good leadership. He asked the fellows to consider, "Are you a bridge or a roadblock?" They also heard presentations from Little Rock area director Kelly Lyon and chief financial officer Greg Gunderson. At lunch, the fellows heard from a panel of extended campus students in graduate programs and undergraduate degree completion programs. In the afternoon Ken Creehan led a tour of the Arcade Building, a historic building undergoing restorative renovation as it becomes part of the Gateway Campus in 2016. Earlier in the week, the cohort focused on military education and leadership strategies, as well as online learning and institutional data for the global network of campuses. Fellows visited the Gateway Campus, hearing from Metro leaders and students as well as chief financial officer Greg Gunderson at the Old Post Office. Later, Ken Creehan led a tour of the Arcade Building as its renovations near completion.